It's been a week since the 7 train rolled out a new state-of-the-art system, but it hit a snag, causing headaches for commuters. Andrew Siff reports. If you're a 7 train rider who's been caught in an especially bad string of delays lately, you're not alone. Tens of thousands of people have been stuck along the 7 line in the past 10 days, after a long-delayed modernization of the subway line launched -- and got glitchy the moment it went into service, according to Transit President Andy Byford. "The fact we have delays at the moment are indicative there are bugs in the software," Byford told city lawmakers Tuesday. "I have the contractor on speed dial." He said he's still confident that given the resources, he can make the entire transit system state of the art within 10 years. "What's really needed isn't maintaining status quo," said Byford." It's pushing on and modernizing this system." City lawmakers responded skeptically, especially with a request for billions of dollars from the state still in limbo, and a likely fare hike arriving this spring. 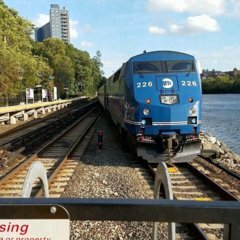 "We are gonna increase fares on the backs of New Yorkers," said Queens councilman Donovan Richards. Byford said "that is a matter for the MTA board, and will only be taken when fare hearings have concluded." The fact that the L has been CBTC since the 2000s and this project was so screwed up is disconcerting. I think it might be time to take a step back and ask if just re-signalling the subway system with upgraded wayside-block signaling is the way to go before dumping tens of billions into "Fast Forward"
This is a different CBTC system than the one on the line. So I'm not surprised their are teething issues. I think the line CBTC will be very reliable like the one is once all the issues are sorted out. Where are the open source alternatives to these things? Vendor lock-in and system incompatibilities were so Microsoft-era. It's not about "bugs in the software" — the signals simply stop working when they get WET. The fact that the L has been CBTC since the 2000s and this project was so screwed up is disconcerting. The was very unreliable for several years after CBTC was completed on that line. It’s not surprising at all. Do you know if there have been any issues with PATH? Yes, at times the signal system will go out or glitch out, according to my PATH yard friend. I like CBTC train. The ride is so much smoother and faster everywhere. A testament to just how terrible timer operation is in the system. AFAIK, no limits were changed as a part of CBTC, just the medium through which they were communicated. Properly done fixed blocks should have been capable of exactly what CBTC does today. Speed limits are raised when they install CBTC. The regular system sets limits based on how close the signals are. If they’re too close the limit has to be lowered to allow enough braking distance from when you first see the yellow to the red signal. CBTC doesn’t use that many signals so a lot of the speed signs are removed. Also there are no yellows because it knows exactly where the train ahead is. This misses a good bit of nuance. Yes, signal spacing is determinate of maximum safe speed, but in a well designed fixed block system (as New York's was before WillyB), the maximum safe speed through an area is the speed around which the signals are spaced. Downwards deviation from those values is indicative not of limitations in fixed block technology, but instead of degradation in train brake performance. Again, CBTC is a cool technology, and should absolutely be installed as areas of the current system reach the end of their design lifetimes. The proposition that it increases capacity beyond throughput gains related to the elimination of human reaction time (+/- 5 seconds of extra margin), however, should indicate to a reader that there is obfuscation afoot.